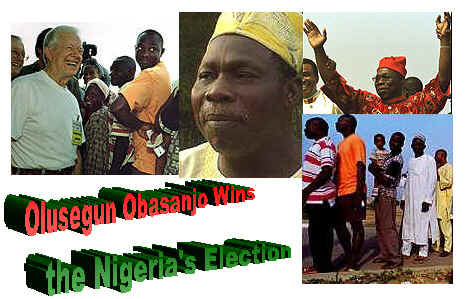 Olusegun Obasanjo Becomes Nigeria's Elected President! Congratulations to Nigerians at home and abroad! Today, May 29, 1999 Olusegun Obasanjo is sworn in as the elected president of Nigeria after many years of abuse under the military rulers. Stayed tuned for the overview of Nigeria's journey to democracy. Free At Last! Free At Last! Thank God Almighty, Nigeria Is Free At Last!!! Nigeria Is Free From The Tyranny Of The Military Rule - A Dawn Of New Hope!!! Olusegun Obasanjo's Election Victory: The former head of the Nigerian Military Government who handed power to a civilian President Sewu Sangari, and jailed by the ruthless leader General Sunni Abacha has been declared the winner of the Nigerian presidential election of Saturday, February 27,1999. The President Elect Obasanjo of the Nigeria People's Party has promised to fight corruption, bring hope back to Nigeria and prevent the military from ever seizing power again.. According to news report from Lagos and Abuja in Nigeria, after a good percentage of the votes were counted Olusegun Obasanjo has a commanding lead over Olu Falae his opponent. Although the election was far from being perfect but the victory of Obasanjo was expected since he had support from the north of Nigeria and the entire east region as well. A victory party is being planned by Obasanjo's supporters in Abuja on Sunday evening. The peaceful election was the first of its kind in Nigeria as it was supported by the United States and monitored by over 11 thousand international observers including former President Jimmy Carter and the former military Chief of Staff General Colin Powell accompanied by the US Congressional delegations. There has always been questions asked whether General Obasanjo will be manipulated by the northerners who have dominated Nigeria's rule for many years. Although it is arguable whether Obasanjo did something differently from his predecessor after the assassination of Muritala Muhammad. But, Obasanjo has been jailed -- being one of the first head of States to be jailed in his own country as a political prisoner -- now has won a democratic election to lead his country once more. I believe Obasanjo has learned his lesson by now. Furthermore, Obasanjo is in a strategic position to unite the country from the large support from the east and north of Nigeria. Appeal to Yorubas: Those grumbling Yorubas need to swallow their pride and be reasonable! We came a long way folks! We can't go back to the politics of divisiveness of the past. 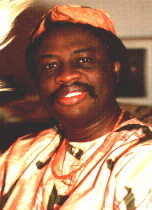 Obasanjo should not be a Yoruba president to cater only to the needs of the Yorubas. He should be president to Ibos, Ijaws, Shekiris, Hausa, Yorubas and all Nigerians. Living in America for the past 27 years has taught me the danger of factional divisiveness -- nothing will be achieved but political chaos. Although we Yorubas may be angry that the northerners have ruled Nigeria to disaster, remember that Abubakar is also a northerner. He is the one who led Nigeria into the freedom of a democratic government after the divine intervention of the Almighty which took the ruthless Abacha away. My appeal to Falae and his supporters is to respect the democratic process and don't start another political chaos in Nigeria. In an election, somebody has to win and somebody has to lose -- it is part of the realities of life. But, being a winner is not what matters, we should put the love of our country ahead of any ego or self gratification! The purpose of democracy is not to create a government on monolithic ideologies of the few, but to develop a working democracy from the heterogeneity of ideologies from different ethnic groups. Consequently President Obasanjo must unite the nation and bring Nigeria together as one. Remember the old Nigeria Man-Of-War-bay saying in leadership training, "If you are neither following or leading, get the heck out of the way!" We have a lot of work to do, Nigeria needs to be modernized and developed. 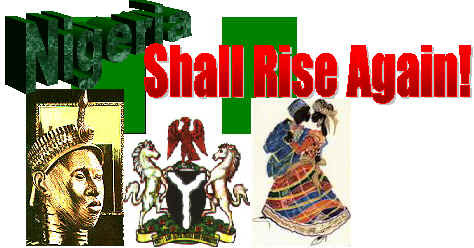 Tell the British people that Nigeria is no longer an ailing giant. Nigeria - the pretty Black woman comes back to life and the ailing giant is healed! Thanks to President Clinton: From few contacts I had with the Whitehouse (sometime difficult) and the US. States department, I was aware of the persistent and on-going efforts of President Clinton for the implementation of democracy in Nigeria. I greatly admire him for this. President Clinton, I utilize this opportunity to thank you and other international observers including General Colin Powel, Former President Jimmy Carter and the Congressional delegations for their interest and enviable work in monitoring Nigeria's election. As a nation, we are not perfect, but I assure you, we will get better, thanks. Report by V 'Yinka Vidal, OUTCRY Magazine, Lara Publications.